I’ve felt kind of radio silent this summer, and there’s a good reason for it. I’m in the middle of three months in Europe, with my headquarters in Germany. To the casual observer, it might seem like this trip came together quite quickly (I first mentioned it to friends in the beginning of April and had arranged it by the end of the month), but it’s actually been in the works for 17 years. This summer, I’m back in Gelsenkirchen with my former host mother, Ursula, even sleeping in the same room I occupied for a year as a teenager. Everything is simultaneously the same and different. The house is just as it was, but her two younger children are now grown and out of the house, and her husband, Hans-Josef, died a few years ago. I immediately remembered the walkways from the main street through the Siedlung to the house, but the streets seem much smaller than I remember. My concept of a big city has evolved quite a bit since I was 16, when in comparison with my hometown of 5,000 people, Gelsenkirchen (about the size of Dayton) seemed very large to me. How do you afford three months in Europe, you might ask? Well, for one, it isn’t a vacation. I’m working as normal, just from a different time zone. I sublet my apartment in Cincinnati so my rent is covered and my cat has people to hang out with. The money I’m saving on rent more than covered my flight out here, and my housing in Germany is free. I’m sharing the costs of groceries (which are already very cheap here) with Ursula, and trying to pair up my excursions with assignments so I can write off the travel and keep getting paid. I’m basically saving money by living in Europe. From this vantage point in northwestern Germany, I’m actually finding more stories to pitch — Quartz, which I regularly write for, is focused on international business, so being outside the US is advantageous. The rest of my freelance work is running as usual; I just had to ensure direct deposit was set up for payments for all my accounts or that clients were willing to mail checks to Germany (and I can then deposit them with my credit union’s app). Where am I going this summer? Where aren’t I going? So far I’ve been to Berlin for a week, which was just as rad as everyone says, and then I flew back to the states for five days for YxYY in Palm Springs, which was totally worth the jet lag. The area I’m living in is close to Essen and Düsseldorf, which are also cities worth seeing, and I’m planning trips to Reykjavik, London and probably Berlin again before the end of the summer. 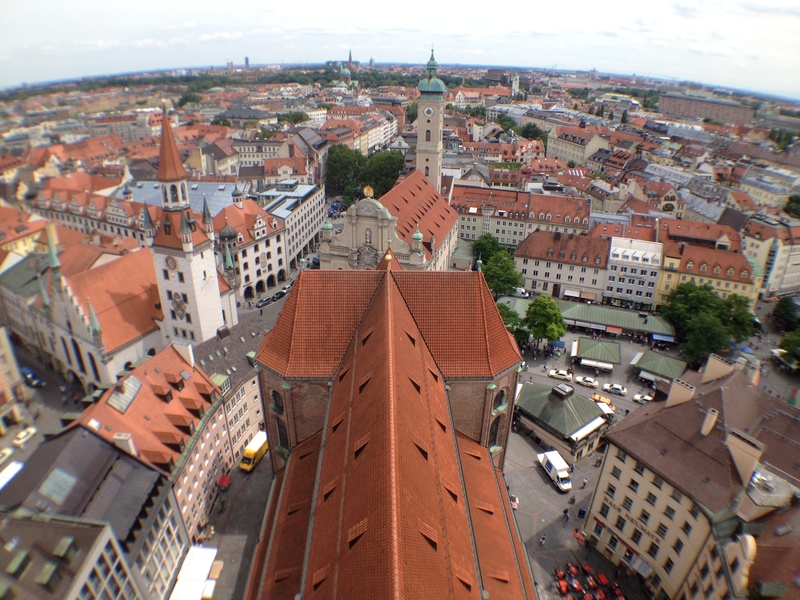 This past weekend I took the train to Munich, where I was writing a travel story for Cincinnati Magazine. From there I took the train to Friedrichshafen, where I wrote about the largest amateur radio meet in Europe. And then, just for kicks, I took a ferry across the Bodensee (Lake Constance) to spend a day in Zürich before flying back to Düsseldorf last night. The two stories I wrote just about paid for the entire excursion, so basically free trip! Before I booked my flight, I was scared. I reached out to a Facebook group of women freelance writers I’m a part of for encouragement. Their general reaction was: “This sounds perfect, you’d regret not going, and if you don’t want to go, we’ll go.” Point taken. The stars aligned perfectly for this to happen, and it would be a smack in the face of the universe if I didn’t go. From quitting my job to go freelance three years ago, I realized that I’m not afraid to shake things up in my life sometimes. I actually get antsy if things stay the same way for too long. “Great things happen outside our comfort zone,” one of my fellow ladywriters told me. And it’s so true. Hi Grace! This is Lynne from the library in your hometown; your Mom said you were over there for the summer. If you get a chance, you might like to check out the area of Darmstadt, just south of Frankfurt a/M in Hesse. The last czarina of Russia was a granddaughter of England’s Queen Victoria and sister to Hessia’s last ruling Duke and some of the architecture is incredible,plus it’s also a center of the high-tech industry. I hope you have a great time on your visit!